In February and March this year, Tina and I decided to do CELTA courses with ECC in Chiang Mai. During our courses (we did the CELTA separately on two consecutive months) Tina and I kept an audio diary of our experiences. You can listen to this below. CELTA stands for Certificate in English Language Teaching to Adults, and it’s a highly intensive four week course resulting in an internationally recognised English teaching qualification. 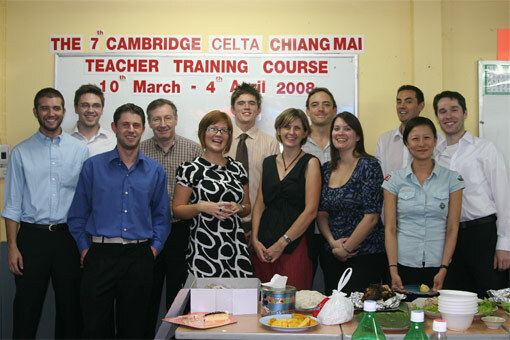 CELTA is one type of TEFL (Teaching English as a Foreign Language) qualification. For information about the CELTA course we did, along with its costs, please see my previous post from March. hi well done on your CELTA course. Sounds like a huge achievement – i now too am a little scarrrreed! how will you go about using this info. now – do you get employment through a language centre or do you send your cv in to schools or did you do the course for other reasons (which do not of course have to be mentioned) just a yes or no will do fine. just wondering about the specific point on what to do with this course once a person has passed. Hi Priscilla – it all depends on the college you do the course through. Ecc are quite supportive with helping to find jobs after the course, and have even offered some course graduates some initial teaching hours through them. A good resource to look at is Tefl.com as they seem to have lots of different teaching jobs coming up around the world – all of which have different contracts and applications procedures. Good luck! Thank you SO MUCH for the podcast, and for sharing your tips. I will be taking the CELTA course in Chiang Mai in August, so I’m doing my best to prepare for it now. Do you have any advice for me before I get to Chiang Mai? I’ve ordered “How to Teach” but haven’t gotten it yet. Is there anything else I should be doing / studying to make the course a little easier? thank you sooo much for the podcast, ive been trying to read up on CELTA experiences could hardly find any, until i came here, even though its from a year ago..
im starting the course this coming monday, in bangkok, and im petrified!!! hehe anyways thank youuu!!!! much much thanks for the podcast. Congratulations! Is Tina German? She speaks weird. Hi Dervla, she’s actually Danish! 1. Was there a set timetable? I mean, was it 9-5 etc? I want to carry on my Thai language course at CMU whilst doing the CELTA. I know how hard it is, but the Thai course is just a couple of hours/week. 2. Were ECC helpful with getting people jobs afterwards? Some part-time work would be perfect. 1. There was a set timetable. I think it was sometime like 9-15. But to be honest – you really don’t have time to do ANYTHING else than CELTA and the homework for CELTA that entire month. For your own sake – clear the calendar completely!!!! 2. The CELTA course itself had 2 full lessons devoted to “job search”. I thought they were very helpful. The best of luck with the course. Hello! I know that it’s been quite some time since this post, but I appreciate your perspectives and I think we share a general outlook. That being said, I am planning on taking a CELTA course in Chiang Mai this coming spring and would like to know why you chose ECC over the international house course, and if you have any suggestions on reflection for someone newly entering the TEFl scene. Thanks! I’m very interested in CELTA course. Is it possible to take it in Moscow or nearby? I’m not scared with the tension and very busy schedule if it’s worth doing and it is useful.